Times for the shows will be posted there when they are decided upon. Typically, shows are recorded on weekdays in the evening. Also, you can follow Ott on Twitter to be notified of when a show is about to begin. For those of you using smartphones, such as an iPhone or Android, you should be able to get an app for listening live as well. Besides being among the first to hear new episodes, you will be able to interact with other listeners on the page’s chatboard, contribute to the show as it unfolds, and hear what goes on during the breaks (the internet show of our internet show?!). As always, the show will still be available as a podcast via iTunes or from here on this site. Hi Fans…So sorry for the delay recently in getting a new episode up. Work and parenting schedules have gotten a little tricky for us, and now I’ve got an upcoming vacation that’s going to prolong our unintended hiatus just a little longer. We are working on solutions so this doesn’t happen often and look forward to having a month’s worth of material to put into episode #40. In the meantime, to stay sharp, we’re still emailing each other more than can really be healthy…here’s a taste of that to hold you over for another week or so. Back soon, we promise! Just let me know what day works for next week. I’ll try to get some material together on Saturday. Should huntwood come on to talk about baseball? Yeah, I’m wondering if the material I have is getting old at this point? I’m not sure on a day, I have to work, like every night…can you do Sunday evening, or Monday late? If not, I’ll have to see what day I can go in a bit later and let you know. Sunday is out. Wedding reception in the city, Monday f’in blows. IF one of us just wins the damn lottery this would be a hell of a lot easier…. Please help support the show by purchasing something from the store. It not only helps pay for the web space to host the show, but it helps us get the word out about the show every time you wear/display your gear. 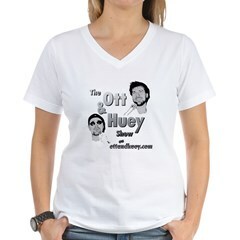 Check back soon for even more new stuff from Ott and Huey. Want to make football picks along with Huey and Bubby? Well, I wanted to, so I thought Yahoo would be a good place to track the competition. The league is set to drop your lowest week’s score, so if you’ve missed week one, don’t worry, your still in the running. We’ll also announce each individual weekly winner on the show. Prizes? Well, maybe, but no guarantees right now…stay tuned. Congratulations to Huey and family on the birth of his son (we all know how much Huey loves to be congratulated)! That means no more pregnancy, red alert or lamaze talk on the show, but probably some great spit up and parenting talk to come soon. Have no fear, plans are being made for Episode #18 as we speak, which will be recorded even with Huey out on maternity paternity leave. You can now give The Ott and Huey Show a call, leave a voicemail, or send us a text at 347-688-4839 (347-OTT-HUEY). Drop us a line to comment on something you heard on the show, something you’d like to hear, or anything at all, really. If we get some good messages, we will play/read them on the podcast…leave us your name and where you’re calling from to improve your odds of getting mentioned. If this goes well, live call-ins while we record will be next, so get to the phones. 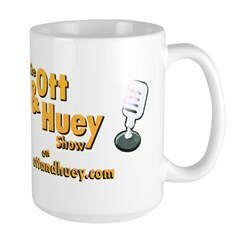 The Ott and Huey Show will begin podcasting soon. In the meantime, we’re just trying to clean up the joint, so we may seem a little under construction. Check back for more information.